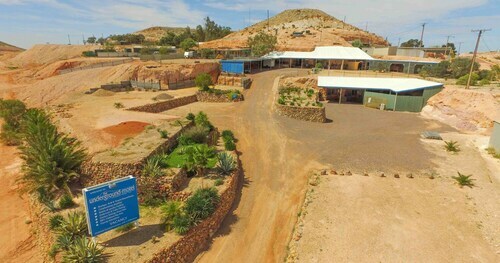 Located in the heart of Coober Pedy, this motel is 0.6 mi (0.9 km) from Old Timers Mine and 2.3 mi (3.7 km) from Coober Pedy Golf Club. You probably know Coober Pedy as that famous outback town where half the population live underground. But reading about it ain’t no match for visiting. The opal capital of the world, this South Australian town has underground bars, churches and art galleries, a golf course with no grass, and a surreal desert moonscape. Fed up with mainstream holiday destinations? A trip to Coober Pedy is way more underground. Book your Coober Pedy hotel with us! For thousands of years, the Coober Pedy region was the base of nomadic Indigenous people who travelled frequently to find water and food. In 1915, prospector Jim Hutchison and his son William were unsuccessfully searching for gold in the area with two other men. One night they set up camp and began looking for water when William found pieces of opal on the ground. Today, Coober Pedy mines and produces more opals than anywhere else in the world. The harsh weather and the search for the precious jewels have driven many miners and their families to live in underground "dugouts". The name Coober Pedy comes from the Aboriginal phrase "kupa-piti", meaning "white man in a hole". Where better to start than a below-ground tour? Visit Faye’s Underground Home, built by three women using picks and shovels. It’s just like a regular home, but underground, with neatly made beds in cavernous bedrooms and framed pictures hanging from rock walls. Enjoy a drink or a game of pool at the Desert Cave Hotel’s underground bar, have a romantic dinner at the Underground Restaurant or check out the Catacomb Church, a chapel cut into the sandstone. There are things to see above the ground too. Moon Plains, about 15 km north-east of Coober Pedy, has appeared in several movies like Mad Max Beyond Thunderdome. A place that was all sea 120 million years ago, the lunar-like plain of cracked soil stretches as far as the eye can see and feels surprisingly soft beneath your feet. If you can hack the heat, head to dusty Hutchison Street for a pub visit, some pizza or maybe even a little opal shopping. While you’re there, check out Josephine’s Gallery and Kangaroo Orphanage (the name sums it up well). Feel like a golf game? Coober Pedy Opal Fields Golf Club is the world’s only grass-free golf course. Instead of greens, it has "golf blacks": dark patches of oil on the sand. With flat, sandy ground and rolling dunes, it’s a little like golfing on the moon. You can explore Coober Pedy on your own or as part of an outback tour. There are many ways to get there. If you’re already in Adelaide, you can take the Stuart Highway, but if you don’t feel like driving the whole the 846 km, you can also catch a train or bus. For more info, check out our flights to Adelaide and flights to Coober Pedy to get started on an unforgettable underground adventure. Rock on! How Much is a Hotel Room in Coober Pedy? 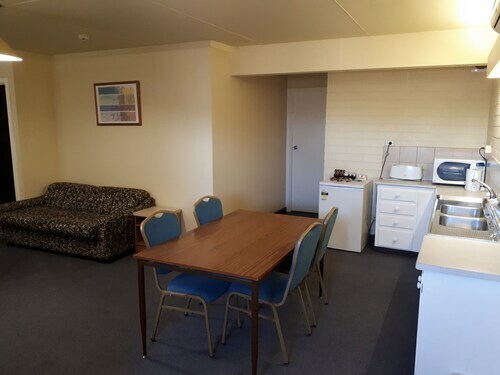 Hotels in Coober Pedy start at AU$132 per night. Prices and availability subject to change. Additional terms may apply. Very large three bedroom apartment. Beds were comfortable and cool. Just what we needed at the end of a long day travelling.